Release the tie rod end. Front hub ready for next step. We took a bit of a step back this week as Mike completely replaced the front wheel bearings that were previously installed. He did this because the front wheel bearings didn’t turn as freely as the rear wheel bearings. So, this week’s posts will all focus on the step-by-step process of removing, reworking, and replacing everything to do with the front wheel bearings. Let’s do this thing! Part 1: Removing the front wheels, brakes, and hubs. 1. Start by removing the front wheel with an impact wrench. 2. Front disc brake is now exposed and needs to be removed to reach the wheel hub. 3. Remove the brake caliper with a socket wrench and just let it sit to the side (no need to detach the brake lines). 4. Remove the brake rotor to expose the wheel hub underneath. 5. Using a puller, release the tie rod end from the bottom of the wheel hub. 6. Using a wrench, release the upper front control arm from the top of the wheel hub. 7. Now, with a little elbow-grease, the wheel hub comes off easily…just like butter! 8. Up next…removing the wheel hub bearings. Mike is now working with the brake lines. 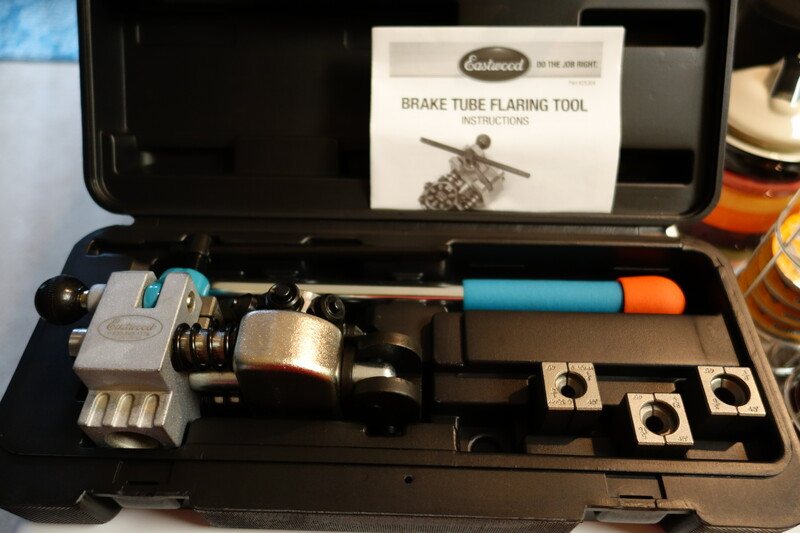 He purchased a new brake flaring tool, 50 feet of stainless steel brake tubing, and stainless steel flared ends. These will be used to fix the front brake lines that have already been run, but currently leak, as well as for the rear brakes and clutch. He has found that the brake tubing is difficult to manipulate even with the flaring tool, so it’s still a work in progress.